[Santa Cruz, Calif. — May 31, 2016] — Mobile check in is not new. It’s been a reality for airlines for some time now, and it’s been a trending topic for hotels in recent years. Its ultimate objective is to enable hotel guests to avoid long lines and fast-track check in online, including using mobile phones as room keys (or at least picking up keys in advance). Next month, hoteliers will attend hospitality’s premier technology show, HITEC (Hospitality Industry Technology Exposition & Conference), to shop and compare products and services that can support mobile check in or straight-to-the-room initiatives. “Mobile check in is intended to eliminate the need for guests to wait in long lines at the front desk just to obtain a room key,” said Pierre Boettner, CEO of hospitalityPulse, the technology leader in automated room-assignment solutions. “While this process may alleviate stress and time for travelers upon arrival, it actually increases the workload at the desk because rooms still need to be assigned. To aid HITEC attendees in their quest for the ultimate mobile check-in or front-desk bypass solution, hospitalityPulse is presenting five questions to ask each exhibitor before making a mobile check-in buying decision. How does your solution ensure that the room a guest is checking into, is clean and inspected once the guest actually arrives at the hotel? Nothing is more frustrating than checking in ahead of schedule only to find out that your room still isn’t ready when you arrive at the hotel, or that your room needed to be re-assigned, due to a maintenance or other issue. Guests who embrace early check in frequently end up spending the same amount of time waiting at the desk; it is as if they had never checked in at all. Tight orchestration of housekeeping and front desk operations is a critical part of the check in process and shouldn’t be just a casual function of a front desk attendant. Especially when base categories are overbooked to achieve optimal occupancy, the puzzle cannot be solved by letting individual players place pieces on “different boards.” Likewise, guests checking out late may interfere with early arrivals; precise guest arrival patterns are simply unpredictable. Leaving the room assignment process to an already overburdened staff is just a bad idea. A truly streamlined, well-functioning mobile check-in program takes all these factors into consideration -- especially understanding the true room availability on the day of arrival and in real time. Can you ensure that the room features requested by the guest during booking are the room features the guest receives at check in? Overlooking the “small print” in contracts is easy to do, and the same applies to imprints displayed during a hotel booking process. How often have we all seen verbiage such as “Special requests are subject to availability and cannot be guaranteed at time of booking?” Despite such disclaimer, a glimpse at online reviews quickly demonstrates that guests consider such requests as part of “what they booked.” Even without mobile check in, it is already challenging to ensure that all guests’ room feature requests were fulfilled. How would a mobile check in provider deal with the swaps and cascades that make up the house balancing task at time of arrival? How are connecting room requests managed during mobile check in? There are many reasons why guests may have asked for connecting rooms: a family traveling together, with the parents wanting privacy, but with easy access to the children in an adjacent room; colleagues traveling together needing to collaborate on a project late into the night and preferring the convenience of adjoining rooms; or friends who like the convenience of being close, and their proximity enhances their overall stay experience. Any such request for connecting rooms is difficult enough to be consistently considered even without advance check in. Guests wanting to check in to connecting rooms a day prior to arrival can easily turn into an operational nightmare if not handled properly by the mobile check in solution. Are guest preferences from your CRM taken into consideration during mobile check in? Guests don’t mind answering questions about their likes and dislikes when subscribing to a loyalty program. In return, they expect a higher level of service to be provided by the hotel, even when they omit indicating their preferences on their next booking; after all, we are living in the age of hyper customization, so meeting basic requirements shouldn’t be an issue, right? Wrong. Another glimpse at review sites confirms that meeting hotel guests’ requests for specific room features isn’t as easy as allowing a traveler to pick a seat on an airplane. And, no, it’s not a “hotelier-made problem,” and hotels need to do more than “just hire the right – or more – staff.” Once you really dive into the challenges of room assignment, you quickly discover that there is a virtually unsolvable problem. The least you can expect from a mobile check-in provider is to be cognizant of the room assignment problem and hope that their solution doesn’t accentuate what is already an impossible task to complete consistently and well. Do you consider loyalty, VIP, or other guest statuses during the mobile check-in process? And, are other complimentary- or availability-based upgrades considered? Complimentary upgrades are necessary to achieve good occupancy rates. Used intelligently, they are also an incredibly powerful tool to boost guest satisfaction. But when guests who are entitled and accustomed to certain complimentary upgrades are not able to have those accommodations fulfilled, it can cause significant consequences for hoteliers. Just like room feature requests, guests anticipate that their upgrade requests will be honored; when they are not, they become frustrated and annoyed. The last thing hoteliers want to do is convey the message that mobile check-in will negatively impact a guest’s ability to obtain their expected and promised upgrades. Checking in a guest reflects a hotel’s ultimate truth in terms of room availability and the ability to provide the accommodation as expected. When considering a new initiative, like mobile check in, hoteliers need to look past the hype and over-simplifying statements. The operational impact on room assignment and the handling of the check-in queue must not be overlooked when it comes to adding check in to a hotel’s mobile, or overall digital strategy. If finding a mobile check-in solution is high on your HITEC shopping list, please visit with hospitalityPulse first in Booth # 1713. We have the automated room assignment solution that hoteliers need to ensure their mobile-check in program will be a success right out of the gate. 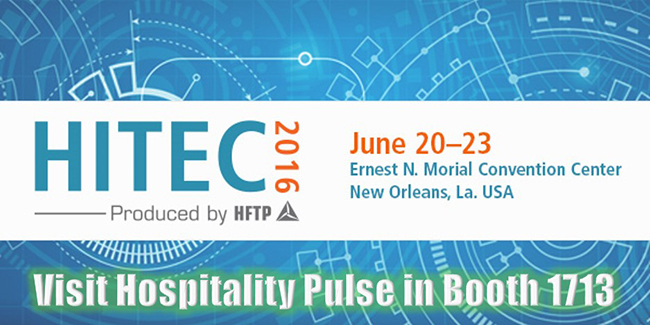 To pre-schedule an appointment at HITEC, call Mario Bellinzona at (831) 824-4952, or email mario@hospitalitypulse.com. For more information on hospitalityPulse, visit www.hospitalitypulse.com.